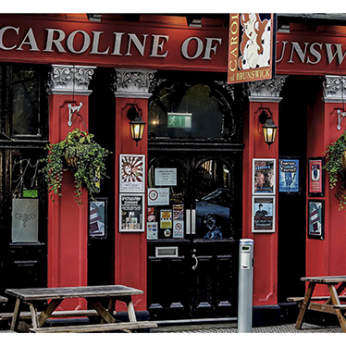 Brighton's most exciting pub is a rock & alternative bar with an exciting 60-seater live comedy & music venue upstairs. We serve great food and fantastic drinks; our real ales are Cask Marque-accredited for quality. Our eclectic programme of events includes several regular comedy clubs, one-off shows by the country's top comedians, as well as live music. We have a sheltered & heated courtyard garden, a function room available for party hire, and a friendly team of staff to welcome you and make you feel at home. Our Upper Lounge Bar is available to hire for private parties, comedy shows, small gigs, film screenings, and other events, from fanzine launches to wedding receptions. The capacity of the room depends on how the furniture is arranged, from up to 60 seated, with a stage in the corner of the room, to 90 or so standing. There is the option of a staffed bar. We can provide a PA system, CD decks, a DVD player/projector with screen, and a separate (though small) dressing room area for performers. Catering for parties can be provided for all budgets, or you are welcome to make your own catering arrangements. Hire fees can be negotiated and are dependent on a number of factors, but some small events can be accommodated free of charge.